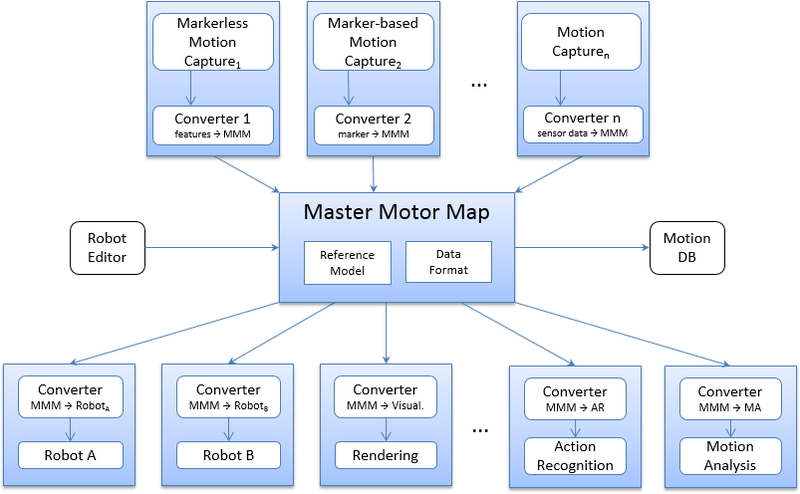 The Master Motor Map (MMM). Part of this framework is a dynamic model consisting of a particular kinematic structure enriched with pre-defined segment properties (anthropometric data) such as mass distribution, segment length, moment of inertia, etc. Moreover, the strategy is to define the maximum number of DoFs that might be used by any visualization, recognition, or reproduction module. Since August 2014, the MMM framework is open source software and licensed under the GNU General Public License version 3 (GPLv3). The documentation is available at mmm.humanoids.kit.edu.